Yes, it's time for yet another giveaway, celebrating a few of my latest blogger milestones, including reaching 20k pageviews as well as being longlisted for the Blog Awards Ireland under "Best Fashion Blogger" and "Best Youth Blogger"
So here's what's up for grabs and how you can be in with a chance of getting this pamper pack! 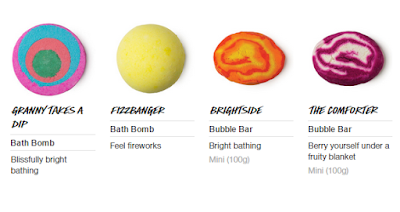 Okay, so today I'm giving one lucky follower this LUSH gift set - Happy Daze - just to make sure your back to school days aren't as bad as you may prophesize! The winner will be announced next Sunday, mainly because my mom can't stand the fruity fragrances around the house for much longer! And make sure you check out my review of The Comforter over HERE too! If Facebook's not really your jam, head over to my Instagram (@sadhbhers) and regram my giveaway post (but don't forget to tag me so that I see!) & tag some friends!